This month Stan focuses his attention on the humble resistor. Andrew Everard examines and discusses the possibilities of a wire-free future. Naim's compact DAC-V1 might be aimed at computer users but it makes plenty of sense as a digital pre-amp too. Chris Bryant tries out the JPLAY audio replay software and the JCAT USB cable. Linn celebrates the 40th anniversary of its timeless Sondek with this special 'fully loaded' record player. Audio Research has combined pre- and power amps in its new VSi75 integrated amplifier. Tony Waldron explains electromagnetic interference mechanisms, and how the EU EMC Directive is helping provide solutions. Chris Bryant tries out four relatively inexpensive m-c cartridges. Martin Colloms explains the evaluation procedures he adopts to achieve the best results with long term consistency. Jason Kennedy flew to Glasgow to find out about Linn's low-loss DSP-based Exakt speaker technology. The Audio Music R-S balanced transformer level control delivers excellent sound at a reasonable price. 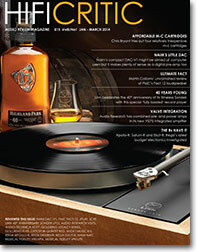 Apollo-R, Saturn-R and Elicit-R: Rega's latest budget electronics investigated by Paul. Martin Colloms revisits an original Naim Nait, first introduced some thirty years ago. Pete Wood explains why it's essential to back up computer audio files, and how to do so. Chris Bryant tries out Musical Fidelity's V90-series headphone amplifier and phono stage. Mastering maestro Bob Ludwig talks about his life and of fighting the 21st century loudness wars. Our annual index to Volume 7's music and hardware features and reviews. PMC's Tom Barron picks his top ten favourite discs. Linn's 40th Anniversary LP12 reminds Paul Messenger of the Linn/Naim alliance... and the split.